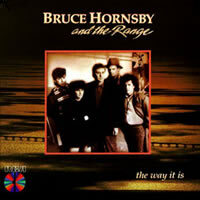 The Way It Is was written by Bruce Hornsby. Released: August 25, 1986 from the album of the same name. Just for fun he says___ "Get a job." Said hey, old man, how can you stand to think that way? Did you real-ly think a-bout it be-fore you made the rules? Bruce Hornsby was born Bruce Randall Hornsby on November 23, 1954 in Williamsburg, Virginia, U.S. He is a singer who plays piano and keyboards. His music styles are varied... rock, gospel, heartland rock, jazz, bluegrass, blues rock and improvises over a range of styles. He has been performing since 1974 and has had associations with a number of artists including Eric Clapton, Bob Dylan, Don Henley, Jerry Garcia, Dave Matthews Band, Grateful Dead, Hall & Oates and many others. BRUCE HORNSBY chords and lyrics are property and copyright of their owners. "The Way It Is" chords and lyrics are provided for educational purposes and personal use only.